The two major methods of assembly for stained glass work are with lead (see the "Lead Came" link to the left) or with copper foil. Zinc came is typically used on outer borders to strengthen a copper foiled panel. Brass channeling and banding are for special applications such as in certain lampshades. Reinforcing rods are used to strengthen a window or panel. Tinned copper wire is for decorative accents, or to make loops for hanging. And, of course, solder is the glue, if you will, that holds everything together. The highest quality solder, from Victory White Metal. It flows smoothly, and is easy to work with. Zinc for framing. It solders readily to both lead and copper. Used instead of lead in most lampshade work, and on many other projects. First you wrap the copper foil around the entire perimeter of the glass, where it is held in place by its adhesive backing. After you have wrapped and fitted together several pieces, you run a continuous bead of solder along all of the exposed copper. You then turn the work over and repeat the process on the reverse. This tin-plated copper wire solders very readily to lead or foil. It is often used in small loops to provide a place for attaching nylon thread or chain for hanging your stained glass suncatcher or panel. Easily bendable, it can be used in many other ways in the design and construction of stained glass works. 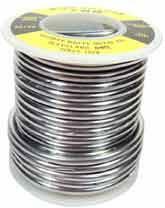 Available in small spools of 14 and 18 gauge, and large 500-foot spools of 14, 16, 18 and 20 gauge. Decorative flexible brass stripping for use in lampshade work as well as boxes, lanterns, trays and other projects where a decorative edging is required.